As Mad Men’s final season draws to its halfway point, it’s only fitting that many of the show’s characters are looking back on the choices they’ve made as they continue to try to move forward into a future that looks absolutely nothing like the world they once inhabited in the early 1960s. Above all else, ‘The Strategy’ is an episode where Peggy Olson, Pete Campbell, Don Draper, Joan Harris, and even Bob Benson examine the choices they have made and the choices they will continue to make. Specifically, they consider how many of these choices—most involving their work lives—have effected their family lives. Peggy looks like she might be on the verge of a Michael Ginsberg-style breakdown after this most recent setback. She’s unsatisfied with her original Burger Chef idea and ultimately decides to abandon it. She’s waking up in the middle of the night to piles of scattered research papers and calling Don on Saturdays to complain that his ideas aren’t good enough. Finally, the two meet on a weekend night in the empty SC&P office and it’s here that they, perhaps out of a feeling of mutual loss and frustration, start to remember why they made such a good team in the first place. This scene reminded me of the brilliant season four episode ‘The Suitcase,’ but in reverse—Peggy is spiraling downward and Don (even though he has plenty of issues of his own) is there for her in a time when she probably needs it the most. Don might be the only person in the world who truly gets Peggy, and Peggy might be the only person in the world who truly gets Don. When she tells him that she just turned thirty, that she’ll never be the mom in the Burger Chef ad, and that she doesn’t even know if that kind of mother or family even exists anymore, Don must agree with her on some level. After all, that family never existed for him. It’s only fitting that the two start dancing to Frank Sinatra’s ‘My Way,’ after all, both Don and Peggy have done things their own way, but sometimes things can be lonely at the top. ‘The Strategy’ also marks the return of Pete Campbell and Bob Benson (Beloit College, Wharton MBA, Don Draper-esque fraud). While Pete’s in the tri-state area to visit his old family, Bob Benson’s in town to start a new one. In a business full of opportunists, Bob might be the biggest one of them all. After learning from a Chevy-executive that SC&P will be losing the XP account and that he’ll be moved in-house at Buick, he asks Joan to marry him, even though dating women isn’t exactly Bob’s thing. “GM wants their executives to maintain a certain type of image,” Bob explains to her. According to Bob, “it would be realistic,” (Bob might be an opportunist, but he certainly doesn’t seem to be a romantic). There’s an underlying feeling of sadness to all of this, especially when Bob reminds Joan that at her age she might not get a better chance to take her son and live in a Detroit mansion. But while guys like Bob Benson (and Don Draper) thrive on fraud, Joan’s looking for something more authentic, even if it means that her son might not ever have a true father figure. Bob cares about family for the sake of work, Joan cares about family for the sake of family—that’s the choice she’s made. Speaking of kids without father figures, Tammy barely recognizes Pete when he returns home to Cos Cob, and Trudy is nowhere to be found. Work (plus some of his other choices) has pushed Pete to California, and now he’s very much a stranger in his own home. When Trudy does finally return, Pete illustrates his frustration by sticking a beer bottle into a cake that’s sitting out on the counter. It’s not quite a nail in the coffin, but I’m pretty sure Trudy’s getting that divorce she wanted. To make matters worse, his messy family life and his duties at the office don’t allow Pete to spend much time with his new girlfriend, Bonnie, and she ends up going back to California early. In the end, he’s really only left with SC&P (kind of like Peggy). In the end, this is what makes ‘The Strategy’s’ final scene so perfect. Peggy’s new pitch involves selling the idea that Burger Chef is a place where people can go to commune. It’s a place where you can forge a bond so deep that your dining partners become your family. 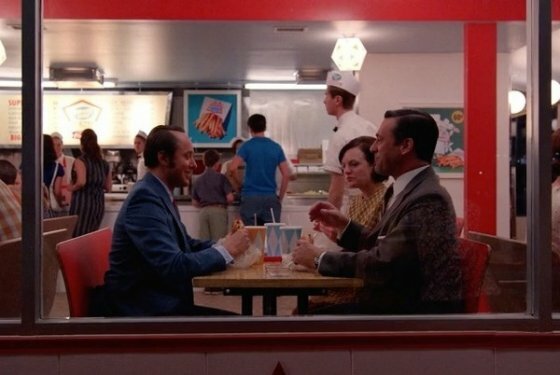 It’s only fitting then that Peggy, Don, and Pete—three of Mad Men’s most interesting, complex characters—end this episode by sharing a meal together at Burger Chef. Both Megan and Bonnie have left for LA (on the same flight no less), but Pete and Don are left behind with their work family. These characters share connections that run so deep—Don is Peggy’s mentor, and Pete and Peggy literally had a child together back in season one. The three of them might not have a lot right now, but they have each other. Once again Mad Men has given us something that looks a little bit like hope. Is it going to take that away from us next week?